Mingalaba! Welcome to Burma. We begin our trip with a group meeting at 6PM. This will be followed by an included group dinner to get familiar with your fellow travellers before we head out. This morning we make our way to one of the greatest sites in Rangoon: the Shwedagon Pagoda and its surrounding temples. We then fly to Mandalay City, our base for the next two nights. Upon arrival, we may walk to Mandalay Hill, where an escalator whisks you to the summit for a great view of the city. Given clear skies, the views of the shrines and sunset are truly worth savoring. Today, from the city’s lively waterfront, we take a boat trip to Mingun, home of the world’s largest – albeit unfinished – pagoda, the world’s largest unbroken bell, and temples dating back hundreds of years. 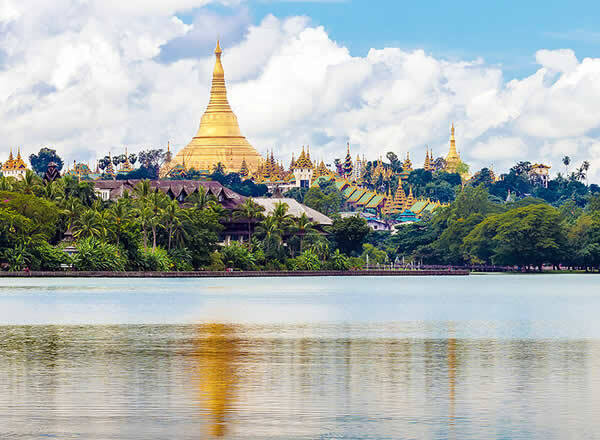 Following a simple lunch at a local monastery, we’ll return to Mandalay and visit various temples, including Kuthodaw Pagoda, which claims to house the world’s largest ‘book’. Weather permitting, we may also view a spectacular sunset over the 200-year-old, two-kilometre-long, U Bein teakwood bridge, either by land or boat. Rise and shine for an early morning start, as we’ll spend the day on a riverboat cruising down the Ayeyarwady (Irrawaddy) River. 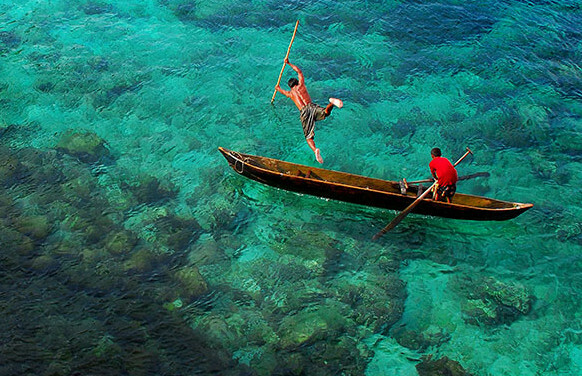 Sit back and relax while rural fishing villages pass you by, and see what a mighty role this river plays. Even better, we’ll overnight in simple, but cozy, rooms on the boat. 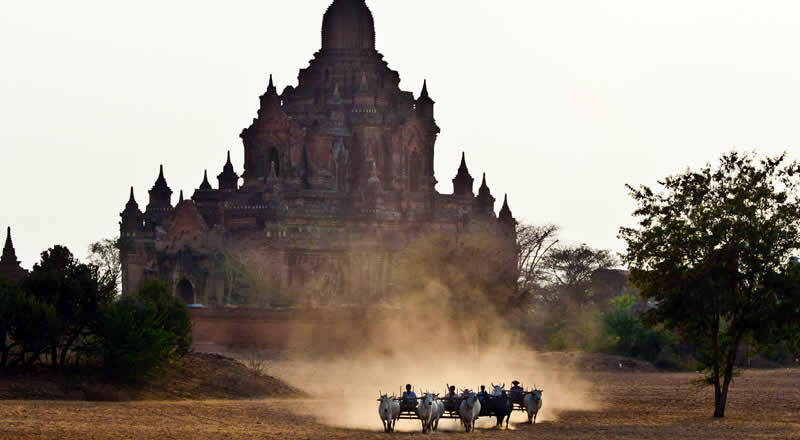 This morning we arrive in the ancient city of Bagan, one of Asia’s most impressive archaeological wonders. 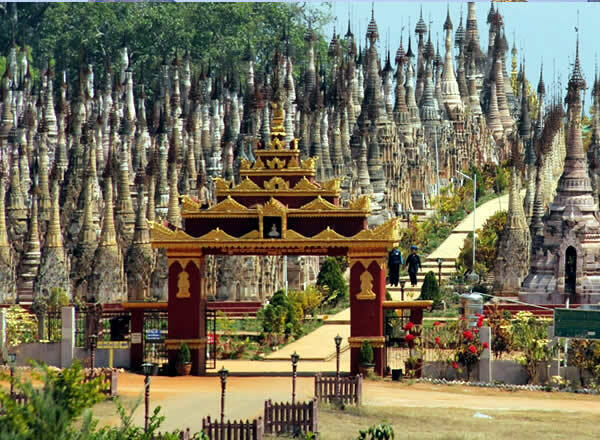 After we check in to our hotel, we’ll explore the sights, and contrast Nyaung U’s lively market with the eerie silence of the plains, where over 4000 structures litter the landscape (including the temples of Gawdawpalin, Thatbyinnyu, Ananda and Shwezigon). If you haven’t grown weary of wicked sunsets, you’re also in for another epic sight over the city’s ruins (weather permitting). In the afternoon, we’ll then begin the drive to Bagan, a one-hour journey. Along the way, we will stop in a local village where the people use the fruit of the palm tree to make wine and molasses. Witness the incredible production process. Then transfer to your hotel and take time to relax. This morning we fly to Heho in the Shan Plateau, followed by a drive through the quaint countryside and rolling hills to Khaung Daing Resort on Inle Lake, not far from the main township of Nyaung Shwe. Upon arrival, we’ll transfer to our waterfront hotel on a traditional longtail boat, leaving us the afternoon to lounge by the pool. Today will be spent on the lake, exploring floating gardens, and glimpsing the local Intha fishermen use their unique ‘leg-rowing’ technique. 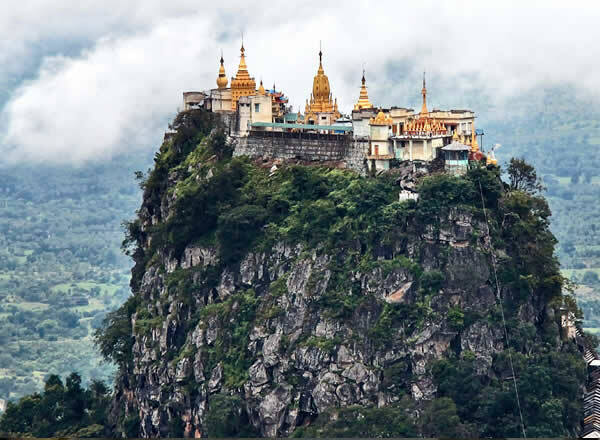 We’ll visit Phaung Daw Oo Pagoda and Nga Hpe Kyaung – the “Jumping Cat” Monastery. Tonight’s dinner is included at our hotel, and your evening is free to relax and reflect on your adventure thus far. After breakfast, visit the lake’s morning market. The market rotates its location around the lake’s villages in a 5-day rhythm and is visited by lake inhabitants and surrounding hill tribes who come to sell and trade their wares. (Note: market is daily except on dark moon day and full moon day). 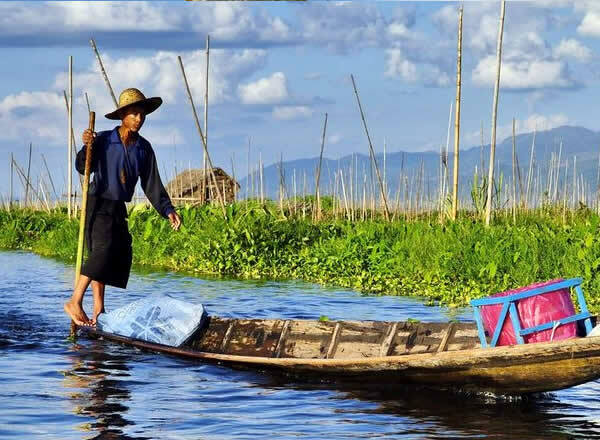 From the middle of the lake, continue down a small canal leading to Indein populated by ethnic Padaung (“long neck women”). You’ll walk on a covered alley lined on both sides with a thousand pagodas. Continue on foot by a long-covered staircase to discover the magnificent complex of Alaung Sithu in a beautiful scenery of ancient stupas buried in vegetation with a panoramic view of the lake. Then, you will drive to Heho airport and take the flight back to Yangon. On arrival, you will transfer to the hotel.